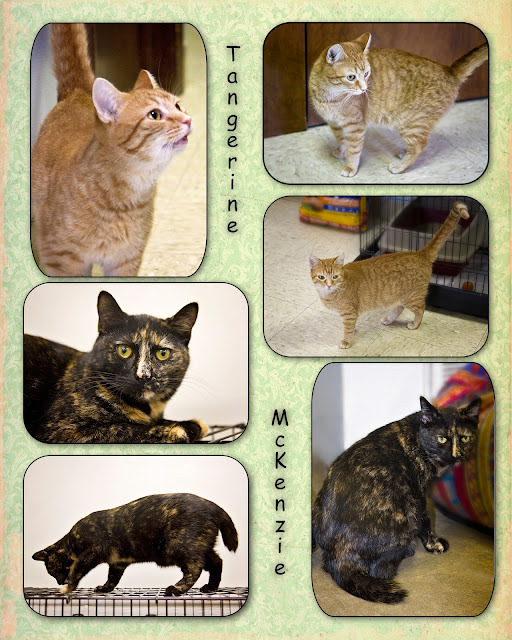 Tangerine and McKenzie are two pretty girls who have been at the Humane Society of Noble County for quite a while. They are both up-to-date on vaccinations and tested FIV-negative. Tangerine is a short-haired orange tabby female who is approximately 2 years old. She has been at the shelter for over a year and needed some new pictures taken. She is on the smaller side for an adult cat. She likes to explore and is very friendly. McKenzie is a short-haired female torti who is 8-9 months old. She only has half a tail due to an injury, which you can see in the pictures. She has been at the shelter for about 8 months. She is a quiet cat, but loves attention. I'm not sure why these two beautiful cats have not been adopted yet, but they are still awaiting their forever homes. Come to the shelter to see how nice they are. Maybe you could make one or both of them yours! Just as I was about to post this, I noticed on the Humane Society of Noble County's page that Hydee was adopted. Yay!! 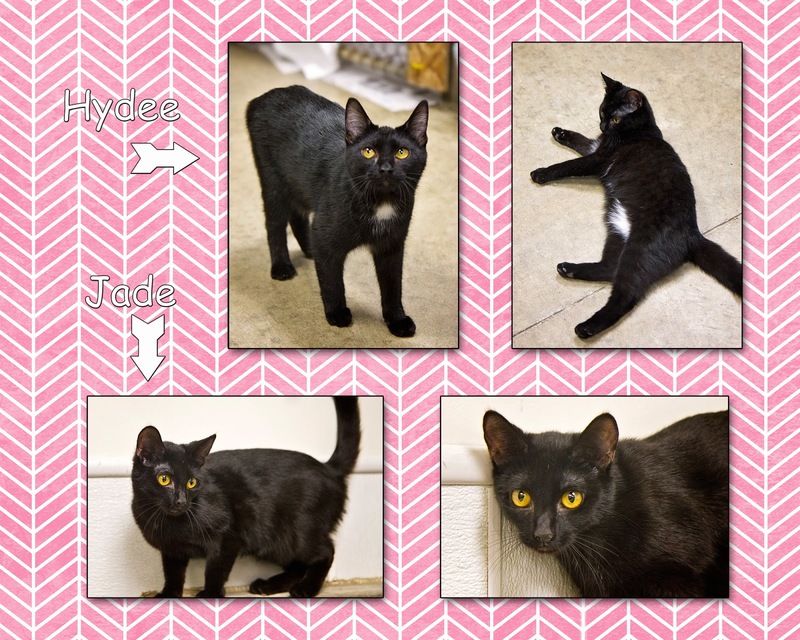 I also know that Jade had an adoption pending, but I don't know if that has gone through yet or not. They are both such beautiful black cats with gold eyes that I decided I would go ahead and post their picture anyway. If you are interested in Jade, you could contact the shelter to see if she is still available. She is about 9 months old and has been at the shelter since late May. She is a very playful girl, loves toys, and gets along well with other cats. She is up-to-date on vaccinations and is FIV-negative. Thank you to Hydee's new family and to all of the people who visit the shelter to adopt pets! 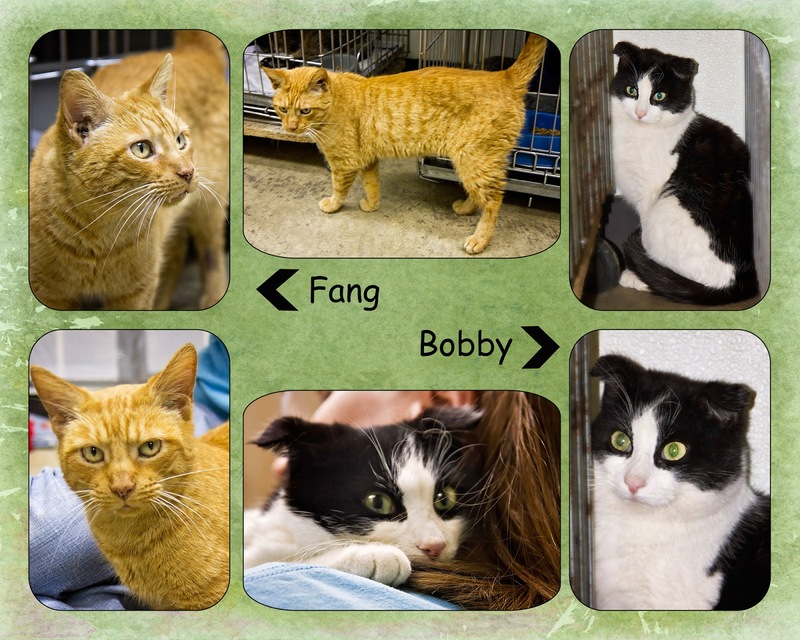 These two boys are Fang and Bobby, who are available for adoption from the Humane Society of Noble County. They are both fairly new to the shelter and are up-to-date on vaccinations. Fang is a short-haired neutered orange and tan male tabby. He got his name because his upper canine teeth are especially long, not because he is a biter or a mean cat. You can see the long teeth in a couple of the pictures. He is actually quite a lover boy, and craves attention! He loves to be held and petted. Fang is 6+ years old, and would love to have a permanent home. Bobby is a medium haired black and white male. His floppy ears might make some people think he is a Scottish Fold, but he is not. Right now, Bobby is a very scared and shy boy as you can see from the pictures, but he is also very sweet. If he trusts you, he likes to be held and petted. He just needs someone with patience to make him understand that he is safe. He is 10-12 months old, and is awaiting his forever home with loving people. Come to the shelter to visit these boys and the other cats and dogs who are available for adoption. Meet Mariah and Elena, sisters who were born at the Humane Society of Noble County on March 27, 2015, and are now 10 months old. They needed new pictures because they have definitely outgrown their kitten pictures! Both are short-haired females who are basically black with a few white spots. They are up-to-date on vaccinations and are FIV-negative. Mariah has a few white chest hairs, which you can see in a couple of the pictures. She is energetic and playful and loves a variety of toys. In the top two pictures, she is watching a toy which was being dangled above her. Elena has more white on her chest and also some white on her tummy, which you can't see from these pictures. She is also fun and playful, and the pictures show that she loves toys. Both of these girls get along well with other cats and don't seem to mind being around dogs. They are both waiting for their loving forever homes, so come visit them at the shelter! These pretty kitties are Regina and Scarlet. They are available for adoption from the Humane Society of Noble County. Both are up-to-date on shots, worming, and flea prevention, and both are FIV-negative. Both are also spayed females, and long-time residents of the shelter. Regina is a black and tan tabby with a lot of orange throughout her fur. She is approximately 4 years old and has been at the shelter for almost a year. 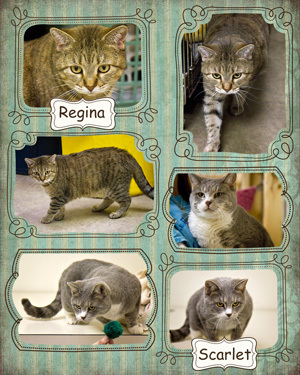 Regina is a VERY friendly girl! She will rub up against you and purr until you pet her. She would make a wonderful, loving pet! Scarlet is a gray tabby with white around her nose and mouth, her neck, chest, tummy, and paws. She is 4-5 years old and has been at the shelter for over 2 years. She is a little shy, which is possibly why she hasn't been adopted, but she loves to be held and petted! She just needs someone who will give her attention and be patient with her until she feels secure. Both of these cats and many other deserving animals are awaiting their forever homes. Can you help them find one? Meet Mac and Chelsie! They are available for adoption from the Humane Society of Noble County, and they are both new to the shelter, having only been there for a couple of days. They are both up-to-date on vaccinations. Mac is a short-haired gray and tan male tabby with beautiful eyes. He is a very friendly and laid back boy and loves to be held and petted. He is also curious and likes to explore. He is 1-2 years old. He will be microchipped before he leaves the shelter. 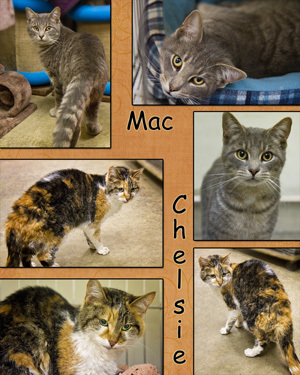 Chelsie is a short-haired calico female with beautiful bright patterns in her coat. She is front-declawed and microchipped already. Chelsie is a senior girl (over 7 years old) and she is a little shy and overwhelmed by her new surroundings, but she seems very friendly and likes attention. Please come visit the shelter and all of the wonderful animals there. Maybe you could give a loving home to a very deserving fur-baby! 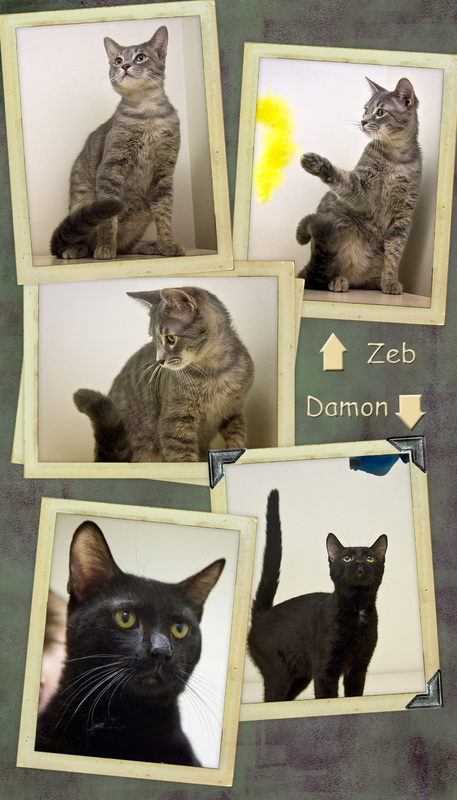 Zeb and Damon are two more boys whose pictures are being updated since their kitten pictures. They are available for adoption from the Humane Society of Noble County. They are both up-to-date on vaccinations and will be microchipped before they leave the shelter. Zeb is a handsome short-haired gray and tan tabby. He was a little shy about getting his picture taken until he had a toy and started having some fun. Once he gets over his shyness, he is very friendly and loving. Zeb is 9-10 months old and has been at the shelter since April. Damon is a short-haired black and charcoal boy. He is 9 months old and was born at the shelter near the end of March. He is also very friendly and playful. In the second picture, he is looking at a toy pig that oinks, and seems quite interested in it! Come visit these boys at the shelter, and say hello to all the other cats and dogs who are waiting for their loving forever homes. Someone will surely tug at your heartstrings! Here are two more cats whose pictures were last taken when they were kittens. 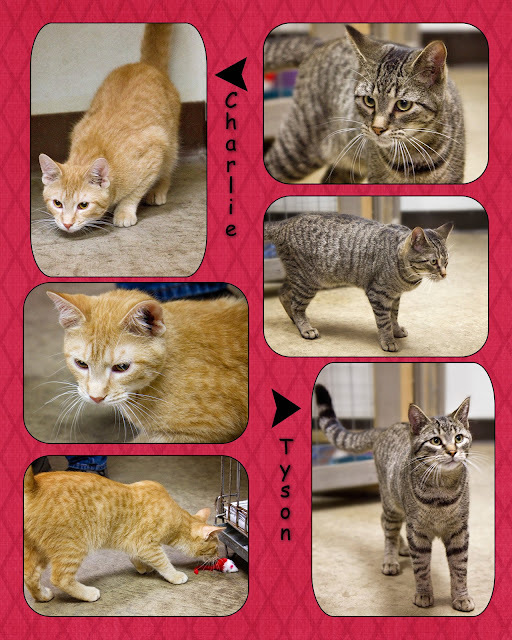 Charlie and Tyson are available for adoption from the Humane Society of Noble County. They are both up-to-date on vaccinations, and Charlie tested FIV-negative. Tyson will be tested and both will be microchipped before they leave the shelter. 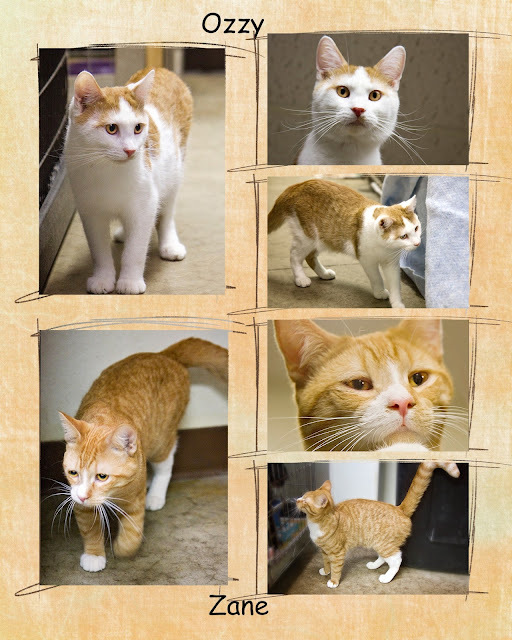 Charlie is a short-haired orange male tabby who is around a year old. He is a mitten-paw cat, which means he has extra toes on his front feet, although you can't tell it from these pictures. He is curious, playful, and friendly! Tyson is a short-haired black and tan tabby who has already been neutered. He is approximately a year old. Like Charlie, he is friendly, curious, and playful. Both of these boys have been at the shelter since April. Come see them and consider giving one or both of them their forever home. Ozzy and Zane are brothers who were born at the Humane Society of Noble County in mid-March, so they are almost 10 months old. They have changed a lot since their kitten pictures, so here they are again. They are both up-to-date on vaccinations and are FIV-negative. Ozzy is orange and tan with a lot of white, including his face, chest, tummy, and paws. His orange parts have tabby stripes and he has beautiful gold eyes! He is playful and loving - likes to be petted and cuddled! Zane is an orange and tan tabby with a little white around his nose, on his chest, and on his paws. He also has beautiful gold eyes. Like Ozzy, he is playful and curious, but also very loving! Come visit these two and many other cats and dogs at the shelter and give some animal its forever home! Davis and Zinc are two boys whose pictures were featured when they were kittens, but now that they are growing up, it was time for new pics. They are both available for adoption from the Humane Society of Noble County, and it would be great if they could be adopted together because they are cage mates and have been best friends for several months. They frequently sleep all curled up together in their hammock or on a blanket. Both are up-to-date on vaccinations and will be microchipped before they leave the shelter. Davis is a short-haired neutered male. He is orange with white on his face, tummy, and paws. He is about 9 months old. Davis is curious and playful, as the pictures show, but he is also a real lover and cuddler! Zinc is a short-haired male who is white with patches of black on his head and tail. He was born at the shelter in early April, so he is also 9 months old. Like Davis, Zinc is friendly, curious, and playful. 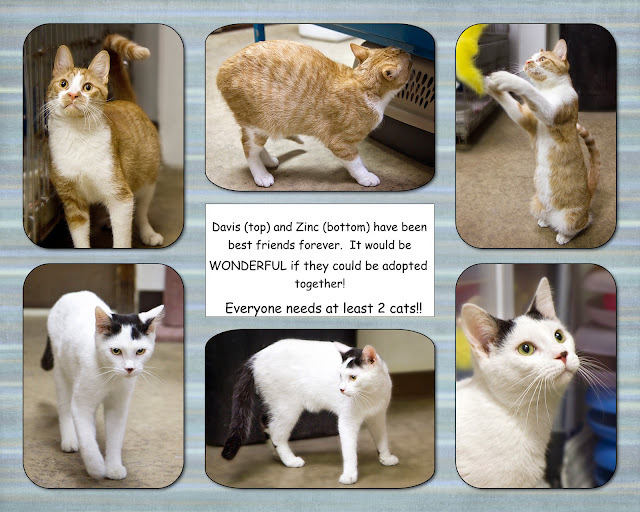 Come to the shelter to visit Davis and Zinc and the many other cats and dogs who are waiting for forever homes!